SEMPAD's CPA Algorithm (which stands for Cost Per Acquisition) is an ideal choice for those who are trying to optimize for leads, sales, client contacts, subscriptions, or any other conversion type that you’ve set. The CPA bid algorithm is actually a combination of multiple algorithms and filters which run daily. There are over a dozen algorithms which run throughout the week and they will adjust your keyword bids up or down in order to generate conversions at a cost you specify on the Algorithms page. Unlike many other platforms, we don’t believe in making large changes all at once. Like yourself, we were ad managers to begin with and feel the best way is to make small adjustments over time and re-assess after each one to determine it’s effectiveness. The good news is our CPA Algorithm does all that hard work for you, so you can set it and forget it! The CPA algorithm currently works for search and search with display campaigns on Google Adwords, Google Adwords Express, Bing ads, and Yahoo Ad Networks. If you're the type to not want to put all of their faith into a bidding algorithm, then be sure to check out SEMPAD's suggestion tool. 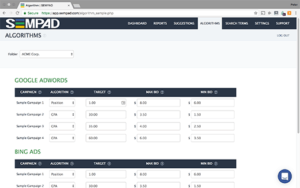 It provides weekly changes suggestions and lets you modify keyword bids or pause keywords from within the platform. Not interested in a target CPA but instead want a position algorithm to attain a specific average ad position? No problem! SEMPAD has that too. Request a free trial here and see how our CPA algorithm and other features can make you even more of a PPC rockstar!